The New Year's Eve suicide bombing at an Egyptian Coptic church that killed 21 people is stoking fears of a new onslaught against Christians by radical Islamists. In response, some radical Islamists are turning to their great bogeyman to deflect attention - the Zionists. "Mossad behind Egypt church blast," Iran's official television outlet, Press TV, said in a headline Sunday. All the evidence points to a Zionist plot, the article said. First, "it goes without saying that no Muslim, whatever their political leanings may be, will ever commit such an inhumane act." In addition, Press TV reported that "the fresh plot by terrorists to target churches is an organized Zionist scenario aimed at creating a rift between Muslims and Christians." Christians are expressing fear the attack marks a widening of attacks by radical Islamists, which have increased dramatically in Iraq. Dozens of people were killed after terrorists took more than 120 Christians hostage in a Baghdad Catholic church in late October. Egyptian authorities are investigating a radical Salafi Sunni group in Alexandria, London's Telegraph reports. The story notes that al-Qaida in Iraq issued a statement two weeks ago encouraging attacks on Copts. The targeted church appeared on a list of 50 Coptic churches in Egypt and Europe published a month ago by Shumukh al-Islam, a group tied to al-Qaida. Al-Qaida threats against Christians have spread as far as Canada. Rather than address the threat directly and offer assistance to stem it, Islamists are building their scapegoat. The rhetoric can't be dismissed as solely the rantings of crazy Iranian mullahs. A Muslim Brotherhood official, an Egyptian lawyers group and Lebanon's grand mufti have all said the same thing, though they offer varying motives. "The Mossad carried out the operation in a natural reaction to the latest uncovering of an Israeli espionage network," the lawyers group said during a rally for the attack's victims sponsored by the Egyptian Bar Association. A member of the Muslim Brotherhood's Shura Council in Egypt condemned the attack, calling it an evil action. Moneim Aboul al Fattouh Abdel said it could not have been done by Egyptians, though he allowed the perpetrator might be the Mossad or someone else of trying to sabotage Egypt. "This assault...is not an individual internal Egyptian act, but a criminal act with Zionist...finger prints that want to sow hatred among Muslims and Coptic Christians," said Lebanon's Grand Mufti, Sheikh Mohammad Rashid Qabbani. The Brotherhood's English-language website summarized an interview spokesman Mohamed Morsi gave Al-Jazeera. In it, he cast the attacks as an attempt to undermine Egyptian unity, questioning whether Israel wants to undermine that. "In whose benefit and major interest is it to destabilize Egypt's stability and safety?" he asked. The Press TV report painted an idyllic image of life for Christians in Egypt, but a doctor treating the wounded from last weekend's suicide bombing disagreed. Many Copts, frustrated by a lack of government action to protect them, are thinking of leaving the country, Dalia Nabil told the BBC. "A lot of us think that this is a plan to make Christians go away from Egypt. The planner is al-Qaida," Nabil said. In anticipation of indictments from a United Nations tribunal investigating the assassination of former Lebanese Prime Minister Rafik Hariri, Hizballah leaders accused Israel of the murder. In 2006, Ayatollah Ali Khamenei said publication of cartoons depicting the Prophet Muhammad by a Danish newspaper was a "conspiracy by Zionists who were angry because of the victory of Hamas." A pervasive campaign has sought to minimize the Darfur genocide as a Zionist attempt to undermine the Sudanese government. An Iranian television documentary depicted the Harry Potter novels and movies as part of a Zionist cultural conspiracy to poison young Muslim minds. 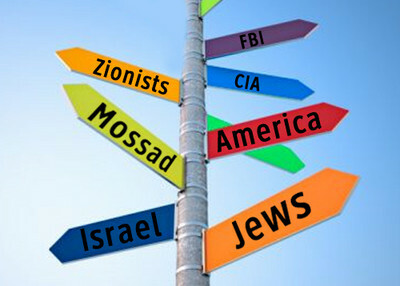 "They [Zionists] are indirectly saying: 'join us,'" a documentary source said. American Islamist leaders are not immune from playing the Zionist card, either. A coalition of American Islamist groups issued a statement condemning a 2001 raid on a Texas computer business for alleged ties to Hamas. "American Muslims view yesterday's action as just one of a long list of attempts by the pro-Israel lobby to intimidate and silence all those who wish to see Palestinian Muslims and Christians free themselves of a brutal Apartheid-like occupation. We believe the genesis of this raid lies not in Washington, but in Tel Aviv." The Council on American-Islamic Relations (CAIR), Islamic Society of North America, Islamic Circle of North America, Islamic Association for Palestine, Muslim Alliance in North America, Muslim Public Affairs Council, and Muslim Students Association were among the groups signing on to the statement. The raids led to the successful prosecution of the company, Infocom, and five brothers who helped run it for laundering money for Hamas chief Musa Abu Marzook and violating sanctions against Libya and Syria. Zaid Shakir, co-founder of Al-Zaytuna College in California, has repeatedly cast the 1993 World Trade Center bombing "as undertaken by Zionist forces to give proof to their allegations concerning the magnitude of 'Islamic fundamentalist' terrorism, and as a pretext to intensify their anti-Islamic propaganda campaign in the U.S. media." When a radical online group called RevolutionMuslim threatened the producers of "South Park" for an episode depicting the Prophet Muhammad in a bear suit, two CAIR officials hinted that the hand of Zionists was lurking in the shadows. "Most suspect the group is fraudulent," CAIR-Chicago Executive Director Ahmed Rehab wrote in a Chicago Tribune column. "Its mysterious leader, born Joseph Cohen, is an American Jew who converted to Islam in 2000 after living in Israel and attending an orthodox rabbinical school there." National spokesman Ibrahim Hooper dismissed the threat, saying "most Muslims suspect they [Revolution Muslim] were set up only to make Muslims look bad." Zachary Chesser, one of the men behind the threats, entered guilty pleas in October to charges related to the South Park incident and for conspiring to provide material support to the Somali terrorist group al-Shabaab. Everyone should believe the Iranian disclaimers concerning conduct of Muslims. Can anyone cite any instance of a Muslim blowing up any place of worship or targeting civilians. The Iranian PR department must be practicing script writing for a comedy show. Fascist Islamists want to have it both ways, as they play it to their convenience: to terrorize the infidel like [statements made prior to the bombing, among Muslim crowds, as AP reported on threatening the Copts that they "must be taught a lesson" or Al-Qaeda-in-Iraq's open declaration, threatening Europe, "Europe, your 911 is underway" at the cartoon-Jihad 2005-6, they dance and celebrate as non-Muslims are targeted 'Allah Akbar' (like in Egypt, 2011, or on 9/11/2001) and on the other hand they still claim that they blame the zionists victims, go figure. Double crimes against humanity. The terrorists who committed the coward attack on The Alexandria Coptic Church, are not to blame, they had just implemented the True Islam exactly as The Sheikhs taught them . They are programmed to faithfully execute what they had been instructed to do. So much for rational dialogue. Do they realy believe this craziness or are they hoping to persuade their own people and the gullible with taqiyah ? What is amazing is that so much of this of this insanity comes from supposedly educated people. Is that culture salvagable? I have great doubts.